New Fellowes Cross Cut Shredder Delivered Today! Today I got a surprise delivery from UPS. Ok, Ok it wasn’t completely a surprise, but I didn’t know when it would be here. My 5-year-old got all excited when she saw the UPS truck pull in and then she freaked out and ran to her room to hide. Silly girl! 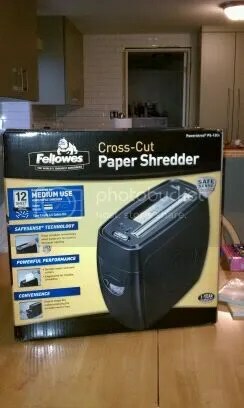 Well the package left was one from Fellowes – a brand new PowerShred PS-12CS cross cut paper shredder. This was a review/giveaway item from the generous people at Fellowes and a wonderful mommy blogger, Jen at Born 2 Impress. There are always a lot of things to read about and enter to win on Jen’s blog. For instance, one that should interest any mommy (or daddy) on the go is the EasyWalker stroller giveaway. She would like very much to give one away, but she has to get her readers (old and new) to ‘like’ EasyWalker on Facebook and leave them a very specific message on their Facebook page. Head on over to the Born 2 Impress blog ok in the right hand sidebar at the top. All the instructions on what to do are there. Even if you don’t need the stroller, please, please, please do this so they can reach a total of 400 new FB likes on the EasyWalker page from B2I. That way moms like me have even a chance to win this totally awesome stroller.